The projecting double porch on the west facade of Drayton Hall, where construction began about 1738, resembles a similar feature at Villa Cornaro, a country villa near Venice, Italy, designed by the Renaissance architect Andrea Palladio in 1551. Palladio is generally considered history’s most influential architect, and Drayton Hall is regarded as one of the earliest and most important examples of Palladian architecture in America. Two interesting questions arise: First, does Drayton Hall embody basic design principles of Palladio, rather than merely borrow Palladio’s double porch motif? Second, if so, how did those Palladian principles find their way from 16th century Italy to 18th century colonial America? The dramatic worldwide impact of the villas, urban palaces and churches which Palladio designed for his patrons in the Veneto region of Italy did not result simply from his attractive motifs such as the double porch. He actually developed an overall conception of architecture as a combination of function and beauty, anchored in rules of harmony and proportion. He distilled his own individual ideas from a variety of sources, including a treatise by the classical Roman architect Vitruvius, visits to Rome to explore and measure the half buried classical ruins, and study of earlier Renaissance architects such as Raphael, Michelangelo and Giulio Romano. Finally, near the end of his career, Palladio published The Four Books of Architecture, setting out his architectural principles and explaining them with woodcut illustrations. Four Books was soon being translated and reprinted across Europe. The first complete English translation appeared in London in 1715-20, with a much better edition by Isaac Ware following in 1738. Although the specific plan of Drayton Hall isn’t found in Four Books, the proportions of its rooms are. 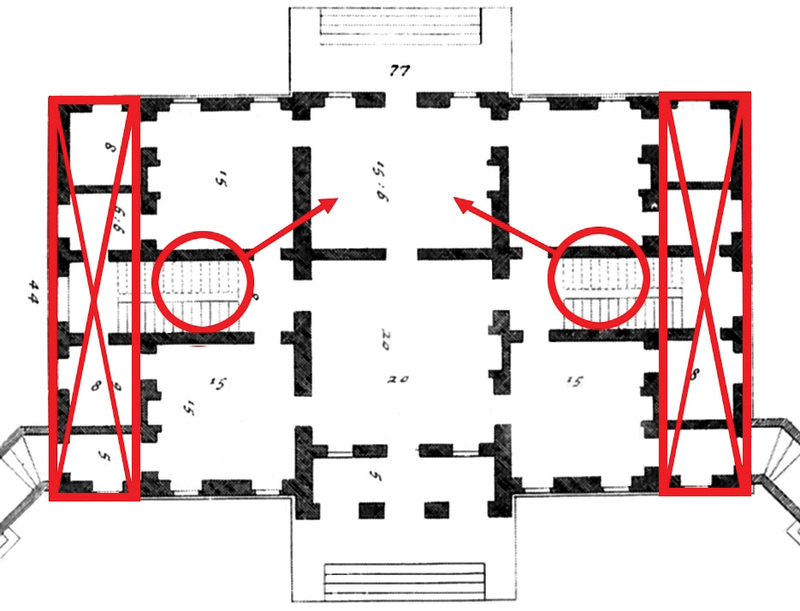 Palladio stated that he had seven preferred proportions for rooms: the circle, the square, and rectangles in proportions 3 X 4, 1 X 2, 2 X 3, and 3 X 5. Fig. 1. The floor plan of Drayton Hall incorporates four of Palladio's seven preferred room shapes. 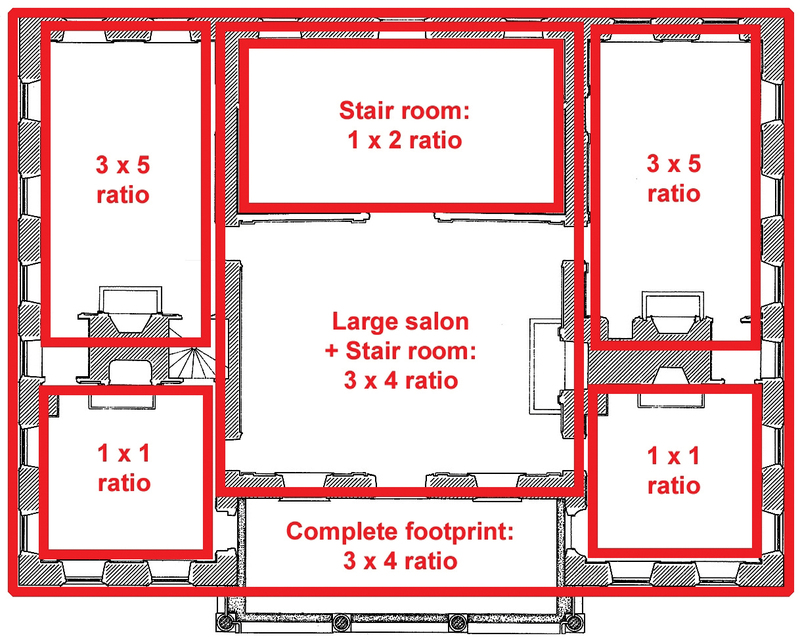 Analyzing the Drayton Hall floor plan (Figure 1) shows that all the major rooms utilize one or another of Palladio’s preferred shapes, so the building is empathetically Palladian in its conception. In fact. the strong correlation of room sizes, combined with the presence of the double porch motif, suggests that the unknown architect of Drayton Hall had a copy of Palladio’s Four Books at hand. Since the precise arrangement of rooms at Drayton Hall does not come from Four Books, did the unknown architect turn to any other source of inspiration for the floor plan? In fact, the floor plan bears a marked similarity to Plate 58 in James Gibbs’ A Book of Architecture, published in London in 1728 (Figure 2). If the row of rooms to the left and right of the plan are deleted, and the stairs are moved from the side to the center rear, the floor plan looks remarkably like Drayton Hall- complete with projecting porch! Fig. 2. After just two adjustments, Plate 58 of James Gibbs' "A Book of Architecture" (1728) bears a marked resemblance to the Drayton Hall floor plan. Recent research at Drayton Hall has actually confirmed that the library of Charles Drayton, son of Drayton Hall’s builder, held copies of both Palladio’s Four Books and James Gibbs’ A Book of Architecture. If the books were inherited from his father, John Drayton, the original owner of Drayton Hall, then the possibility exists that John Drayton himself might be the unidentified architect of the great Palladian house. Carl I. Gable, a native of Charleston, SC, is a businessman and retired lawyer who now divides his time between Atlanta and the Veneto region of Italy. He is president of the Center for Palladian Studies in America, Inc., and has served on the boards of the Spoleto Festival USA, the Atlanta Opera, and the Michael C. Carlos Museum of Emory University. 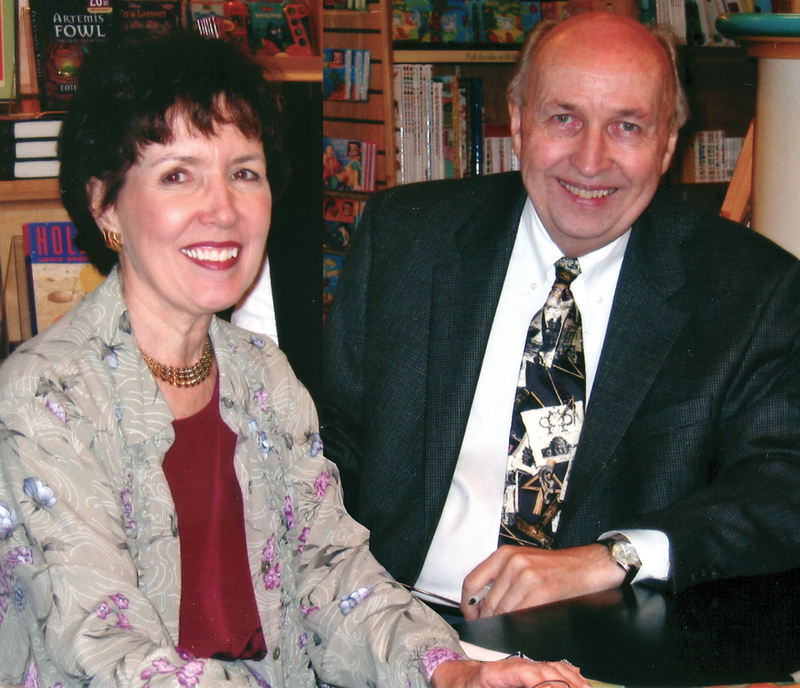 He and his wife Sally are co-authors of Palladian Days (Knopf 2005), describing their experiences as owners of Villa Cornaro, a sixteenth century Italian villa designed by Renaissance architect Andrea Palladio.